I have some really old correspondence from a GeorgeWorsfold in New Zealand. A letter from this George written in 1977 has a paragraph relating to a coat of arms for the Worsfolds apparently granted to a baronet about 1925, a Sir Thomas Cato Worsfold who died without heirs. He also states that details appear in Burkes Peerage. The baronet's Coat of Arms apparently shows a shepherd dog and three lambs and the motto was 'I Watch the Fold'. 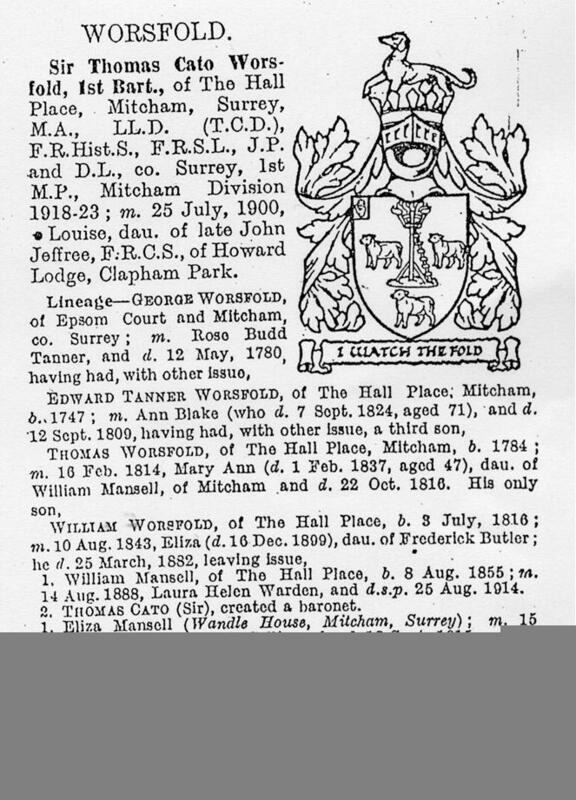 This is quite interesting as the Worsfold Family History Society (Alan Worsfold) shows the motto 'We Watch the Fold'. He also indicated that the name in Old English or Anglo-Saxon was originally Waersfald. Fald apparently meant the Fold (enclosure for sheep) of a person called Waer = that is - Waer's fold. I have seen a number of so-called coat of arms - but have not seen one that is similar to the one described above. There is also a "Worsfold Coat of Arms" produced by one of those folk who have a computer and a printer in shopping arcades. How authentic it is who knows - this copy is in Black and white so if you have some crayons handy you can amuse yourself colouring it in.